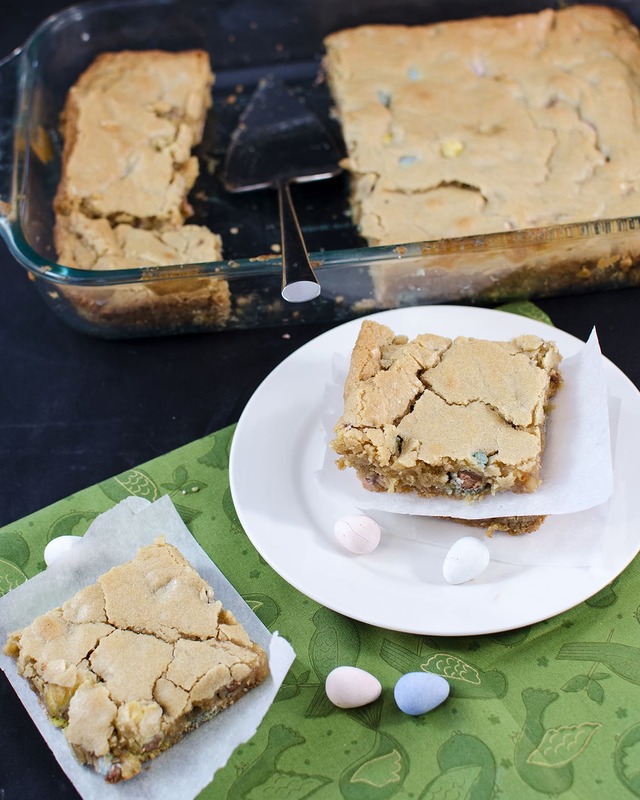 These Cadbury Mini Egg Blondies are delicious soft and chewy brown sugar blondies stuffed full of cadbury chocolate eggs for a delicious Easter treat! Why is it that candy tastes so much better when it’s egg shaped, and pastel colored? 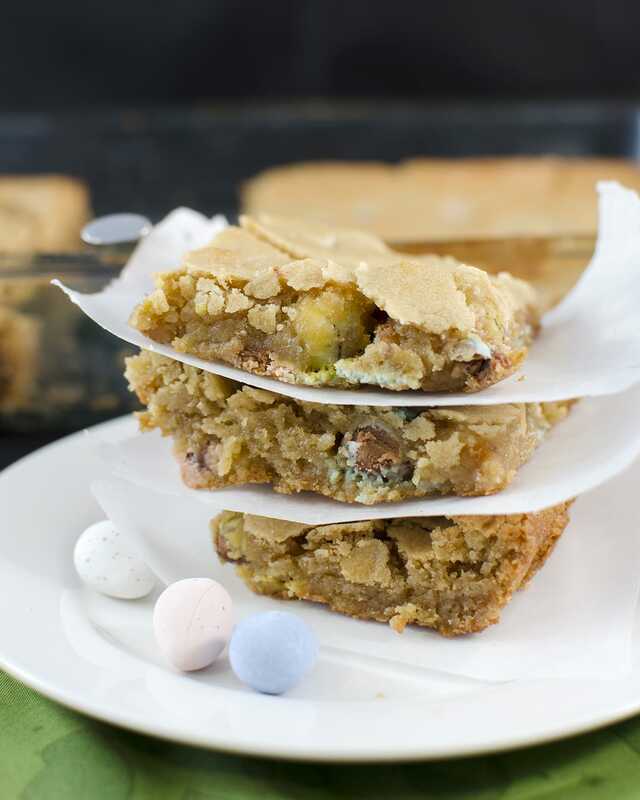 I stuck with my own blondie recipe for these cadbury mini egg blondies. How to make Cadbury Mini Egg Blondies? You make these blondies like most other cookie recipes. First, you’ll mix together your butter and brown sugar in a large bowl till combined. Add in your eggs, and vanilla and stir them in. Add in your flour, baking powder, and salt and stir till you have a nice soft dough. You’ll fold in your mini eggs and spread the batter into a 9×13 pan. The batter is quite sticky so you may need to wet your hand or a silicone spatula to spread it evenly into the pan. Bake it up till the top is nice and golden and a toothpick comes out clean. Once you’re cookies are cooled up they’re ready to slice up and serve! These cadbury mini egg blondies did not disappoint. They have the same delicious brown sugar taste in every bite – like traditional blondies. But in almost every bite you also get a delicious chunk of creamy milk chocolate. Looking for more Easter Desserts? Preheat oven to 350 degrees. Prepare a 9x13 inch baking pan with cooking spray. Whisk together butter and brown sugar in a large bowl until combined. Add the dry ingredients (flour, baking powder, salt) and stir again to combine. Pour in your cadbury mini eggs and fold them into the batter. Pour batter into your prepared pan and spread evenly using a rubber spatula. Bake for about 30 minutes, or until an inserted toothpick comes out clean. Enjoy these fresh or they still taste great a couple days later too. Are these mini ccadbury creme eggs, or robin’s eggs? They look like robin’s eggs. Thanks. Do you think they would still cook ok if I poured the batter into a muffin tin (with cases to stop them sticking) to make individual ones rather than using a pan? I think they would cook fine. Just watch them closely so they don’t burn! I am so glad you like them Hannah! They are one of my favorite simple Easter desserts! Have these in the oven right now! Oh, I hope you like them!! I love blondies! Those look yummy!